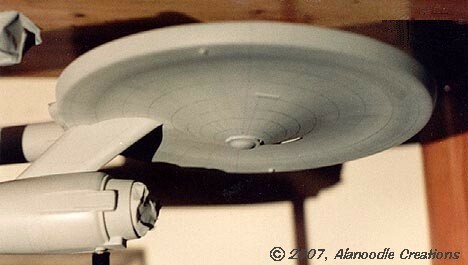 Repainting the Enterprise turned out to be a bigger challenge than anticipated. Something must have been left behind by the original paint job that had a lasting effect on the plastic beneath. Every coat of automotive primer sprayed on cracked as it dried. Spraying several light mist coats and allowing each coat a few days to dry didn't help. When the third or fourth coat was misted on, the primer coat would crack again. This happened even when spraying onto what appeared to be bare plastic. I needed a primer with a milder solvent. What worked was Tamiya acrylic paint mixed with their Flat Base, a paste used to "flatten" the color. Rather than using my preferred thinner of straight up denatured alcohol, I used denatured alcohol mixed with an equal amount of tap water. The primer was lightly sprayed on and there were no issues. I used the color "Light Sea Gray" (XF25) which would also be used for the darker colored details on the model. These details, all illuminated domes and the main sensor were then masked off prior to re-spraying the main color. When it was once again time to match the color of the Enterprise, I was a little more experienced and prepared than I was the first time around. I went with a 4:1 mix of Tamiya Flat White (XF2) and Light Sea Gray which closely matched the color in the photos from my last DC trip. Being a simple mix, it was easy to consistently mix enough for a single painting session instead of mixing up a large batch. Again, the paint was thinned with alcohol and water. The model was given several light coats of the main color. Each coat was given a few days to a week to dry completely and was gently sanded with 1800 grit sandpaper before the model was sprayed again. It was then time to decide if I wanted to give the model those deflector grid lines. The heavy grid lines look very interesting on the big model but is that the Enterprise I remember seeing on TV? They're just not visible when viewing the original episodes. I decided to compromise. I would include the grid lines but make them much less prominent than those that, at the time, adorned the big model. Once the final base coat was fully dry, grid lines were drawn using a #2H drafting pencil. The flat-finish paint took the pencil lines nicely. 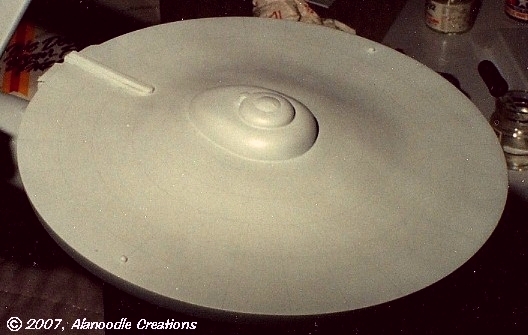 On the saucer, they were drawn radially at 15° intervals and concentrically at half-inch intervals. Lines were also drawn on the secondary hull and engine nacelles. A compass was used for circles and Post-it tape was a perfect straight-edge for straight lines. The base color was then mixed with Tamiya Clear and lightly airbrushed over the grid lines to tone them down and to protect them from smudging. Clear Blue and Clear Green were mixed 2:1 and airbrushed on to highlight the saucer. 100% Light Sea Gray highlighted the dorsal connector and the warp engines. Post-it tape was used again, this time as a secure, low-tack mask. After applying the final coat, the grid lines are faint and barely show up in photographs, much like in the image of the big model in the previous chapter. The model was then lightly weathered with shades of blue, gray and reddish brown to simulate the effects of warp speed on a spaceship hull. (No, really.) 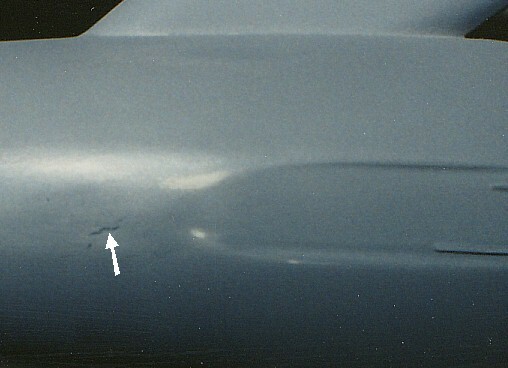 The grids on the inboard engine slots were covered with Bare Metal Foil. A couple of coats of Tamiya clear were then sprayed on, also thinned with alcohol and water to provide a glossy surface for decals.